The first sign that a man has coronary heart disease could be death, says one University of Alabama at Birmingham expert. Coronary heart disease is caused by a buildup of plaque in the arteries to your heart, affecting the flow of blood and oxygen to your ticker. 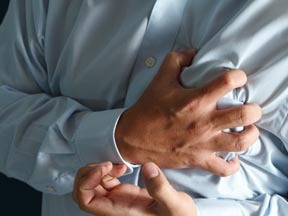 More than half of the deaths due to heart disease in 2008 were in men, and coronary heart disease is the most common type of heart disease, according to the Centers for Disease Control and Prevention. So where do the men’s heart problems start? Gertler says it can date very early in life. “The process of atherosclerosis begins in the teenage years, and takes a long time to develop. That hardening of the arteries is caused in general by years of unhealthy living: smoking, uncontrolled hypertension, obesity, high cholesterol, inactivity; these all tend to accelerate that process,” Gertler says. Some risk factors are beyond your control — a family history of heart disease, age, or in this case gender — but there are things that you can control, and you might want to start now. “Heart disease does not discriminate. Men in their 20s and 30s can have heart attacks,” Gertler says. Gertler encourages men to be proactive in recognizing their coronary risk factors and work to modify them. “Men need to focus on what their appropriate numbers are for blood sugar, blood pressure, cholesterol and body-mass index,” Gertler says. Gertler says the increased prevalence of obesity in the past two decades has led to more young men developing diabetes and living a much less active life, and diabetes is linked to heart disease. He says young people need to focus on participating in some form of regular aerobic activity for 30 to 40 minutes, four to five times per week. So, watch your waistline. It should measure less than 40 inches because of the association between abdominal fat and increased risk of coronary artery disease, Gertler says. Talk with your doctor about a risk-factor assessment. Gertler does this with his patients, to better personalize their individual journey to better heart health. “We discuss the appropriate diets for them — I’m a proponent of the Mediterranean diet — and we also discuss the importance of regular exercise to achieve their ideal body-mass index,” says Gertler. “I will give men an idea of what their 10-year risk of having a heart attack is based on their risks using the Framingham risk score. This often hits home with many men,” says Gertler. Quitting smoking is one of the hardest changes for men, Gertler says. “We’ll talk about their prognosis if they don’t quit. Smoking-cessation is tough because of the nicotine addiction, but it’s often a wake-up call when they realize they may not be able to watch their kids grow up and graduate,” says Gertler. An added bonus for beating the pack? Gertler says if men abstain from smoking for five years, their risk of having a heart event becomes closer to that of someone who never smoked. Gertler says free, valuable sources of information for a healthy lifestyle found on sites such as the American Heart Association at www.heart.org can make it easier to understand the disease and prevent it. “Coronary heart disease is mostly preventable, but you have to be motivated. By modifying risk factors you can slow down the progression of plaque formation in the arteries and your chances of disease can all be reduced,” Gertler says.